If you have HVAC (heating, ventilation and air conditioning) ducting throughout your home, there is now an easy way to control the growth and spread of mold, bacteria and viruses. Introducing the Honeywell UV air purifier for HVAC systems. Ducting is a notorious hot-spot for mold infestations. 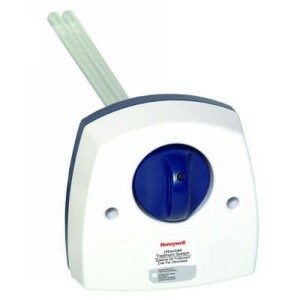 This can cause major issues for people with allergies and asthma because it delivers a fresh supply of triggers throughout the house every time the ventilation is turned on. Installing a UV air purifying lamp directly into the ducting will not only eradicate the existing mold infestation, but it will inhibit any future growths as well as the spread of bacteria and viruses. A common drawback of having a central ducting system is that it helps bacteria and viruses reach every corner of the home. With the installation of a UV air purifier, you can turn this flaw into a great advantage. By eradicating the germs passing through the system, you can be sure that only fresh, clean air is being circulated. Widely used in hospitals, pharmacies and kitchens for their highly effective germicidal properties, UV air purifiers are the ideal choice for homeowners wanting to limit the spread of bacteria and viruses. Although they won’t protect you from infection outside of the house, they do a great job of stopping any germs introduced into the home. Honeywell is a well trusted name on the air purifier scene, and their UV air purifiers are no exception. They produce two models of HVAC UV air purifiers, this one (UV100A1059) and the lower powered RUVLAMP1/C ($160). The major difference between the two models is the strength of the lamp. The RUVLAMP1/C has a lower wattage lamp (18W vs. 36W), meaning lower power consumption but also less effective at killing organisms (<70% vs. <99.9%). Cost of replacement lamps for both units is roughly the same ($20-$25), and they will both last for about one year of 24/7 operation.